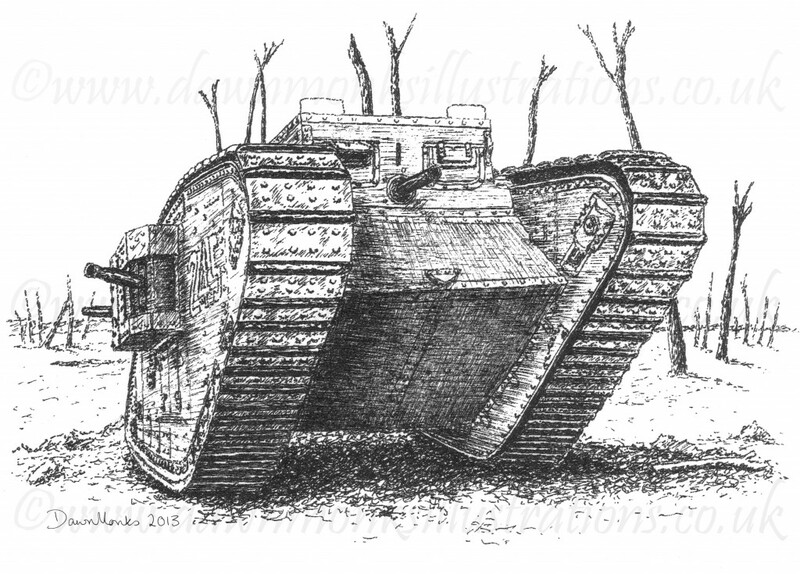 Pen & ink illustration of a British WW1 Mk IV female tank, based on the tank now on display in Ashford, Kent. The Ashford tank appears to have been a training tank – indicated by the three digit number on the side – and was probably used either for driving and maintenance at Bovington, or for gunnery training at Lulworth. She arrived in Ashford by train on the 1st August 1919 as a gift to the town in recognition of the town’s efforts in raising cash for war bonds. As a training tank she would never have found herself in the surroundings in which I have drawn her, but it’s nice to show her in an appropriate setting.